In the world of boss/worker (or master/slave), one of the common overheard themes is, “Who should run (or lead) your company?” Or country? Or organization? Does that person have the right experience? Do you need to be a Coach to be a Head Coach? Or just some likeable Administrator? The classic expression (on the defense side) I hear time and time again is, “You don’t need to be a brain surgeon to be the CEO of the Hospital”. Once again, Stuart McMillan does a fantastic job in interviewing key coaches and athletes to help our sport grow. One of the key points is the selection committee in hiring the right staff, along with the values and framework to get the job done, and that means winning medals at the Olympics and World Championships. As well, the article goes in detail on how Kevin Tyler did not get Canada’s Track and Field top coaching position. Of course, I am heavily biased as Kevin is a friend and my former coach, but people forget he has been to four Olympic Games in four different capacities: as an Athlete, a Coach, in Coach Development, and in Sports Marketing. READ Walter Dix NIKE Spikes? In the traditional model of business, the CEO’s job is to provide value to the shareholders. i.e. make a profit. Period. But in the Head Coaching position, the role is winning medals. i.e. performance. Or top 8 finishers. [READ Beyond the Olympic Medals: Where Do We Go Now?] And that means getting more people in the grassroots system for more qualified athletes the higher up you go in the performance ladder. At the end of the day, you have to choose the right person to lead your team, and you have to have the metrics to prove you made the right decision, whether it’s stock price or gold medals (or in Canada’s case, bronze medals and top 8 finishers). But outside of politics, I will give you my thoughts on Teamwork & Leadership on SpeedEndurance TV in a few days, and my philosophy may shock a few people. Stuart McMillan: What does success look like to you? Derek Evely: It depends upon what level you are talking about. If you are talking about developmental athletics (anything non-elite) then to me success means being able to produce coachable, healthy athletes that have a chance of maximizing their potential. If they are talented and capable of high end success, then it is your job to prepare them so that when it is time for them to move into a truly world class program, the coach there (whether it is you or someone else makes no difference) should not have to spend two years with that athlete correcting your mistakes or rehabbing chronic injuries or dysfunctions. This is a very undervalued (but also under-practiced) expertise in our sport, hence the reason we have a rift between developmental and elite athletics in this country. In elite athletics, success to me is simple: win medals and give back to coaching more than what it gave to you. Stuart McMillan: What messages do you have for a young coach who wants to succeed and make a difference? JIMSON’S NOTE: How many do YOU score from the above list? Stuart McMillan: What is the difference between winning and success? Derek Evely: Winning is placing first; success is making a difference. Stuart McMillan: What are the three most important factors for an athlete to reach success? Train smart and stay healthy. Have faith in your abilities, your coach and the work you have done…you will learn what this means when the time comes. 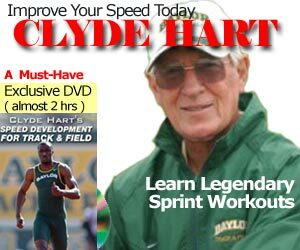 “If they are talented and capable of high end success, then it is your job to prepare them so that when it is time for them to move into a truly world class program, the coach there (whether it is you or someone else makes no difference) should not have to spend two years with that athlete correcting your mistakes or rehabbing chronic injuries or dysfunctions. ” This is the biggest problem with the sport. Makes no difference every elite coach feel they have to correct mistakes of the previous coach. Instead of expanding on the numerous ways to have incredible performance. If you don’t fall into their way then correct mistake away. @adarian, agreed, that’s why some people are better off sticking to one coach for their entire career, but we will always have self doubts. At the end of the day, it’s all about performance.